These free, printable Christmas gift tags can be printed straight from your home computer, cut out, and then attached to your gifts. Not only will you save money by using these printable Christmas gift tags, but you'll also save the time from having to buy them at the store, and they'll add a personal handmade touch to your gift. After all, saving money, time, and showing someone you care should really be what Christmas is all about. We have many more Christmas freebies including more free Christmas printables, paper snowflake templates, printable Christmas cards, printable Christmas coloring pages, and so much more. We also have some other free, printable gift tags that are not Christmas themed but would look great on your holiday gifts as well. Tip: These printable holiday tags can be printed on normal computer paper if you wish but we really suggest printing them on sticker/label paper or on card stock and then using a hole punch and ribbon to create your tags. They are fine when printed in black and white but they look so much better when printed in color. Lia Griffith designed these stunning Christmas gift tags for World Label and they simply take our breath away. We would be thrilled to put these on any gift this holiday season. They're in a chalkboard style and come in tags, circles, and rectangle shaped labels. They have various designs of snowflakes, holly, and pine cones. They're so pretty you'll have to print the whole set out. Gather & Feast has designed some lovely black and white Christmas gift tags that would be an elegant touch to any of your gifts this year. There are 10 different tags here, featuring Christmas trees, holiday phrases, and more. World Label has done it again with these adorable Woodland Christmas gift tags and labels that are completely free for you to download and use on all your gifts this year. You'll find images of foxes, owls, bears, squirrels, deer and more in these traditional tags as well as circle tags. You'll love these watercolor and glitter style holiday tags and labels from World Label. There are gift tag labels as well as circle labels like these that will add an extra special touch to your gifts this year. I love the simplicity of these Christmas gift tags designed by Bloom Designs for I Heart Naptime. They're available in red and white and black and white. The Christmas tags say "Love & Joy", "Believe", "Holly Jolly", "Merry Merry", and "Holiday Cheer. Nina Hendrick has designed these free, printable Christmas gift tags and labels that have a drawing of the iconic image of a Christmas tree on a truck. 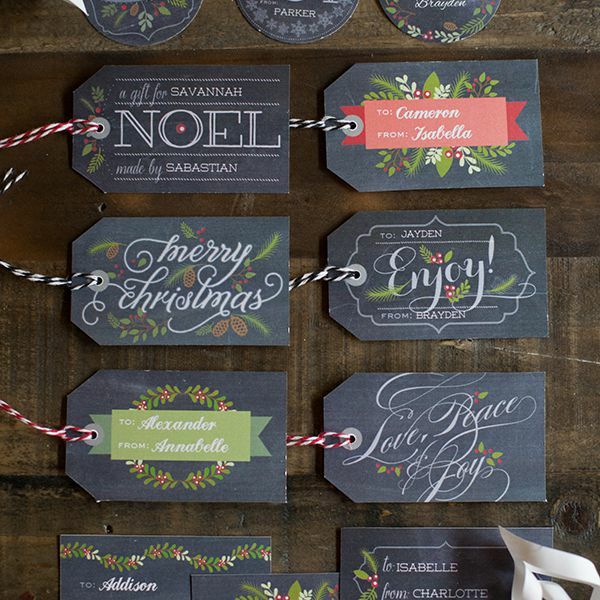 A single sheet of card stock will get you 7 uniquely different printable Christmas tags here. You'll get Christmas gift tags that include mittens, stocking caps, reindeer, poinsettias, toy soldiers, and a winter city scene. Simple As That has designed these modern Christmas gift tags of trees and moose formed from red, green, and gold geometric shapes. These Christmas gift tags are all free to print and print out one per page, making it easy to get just the gift tag you want. These free, printable Christmas gift tags are sure to put a smile on everyone's face. Don't these tags look so much better than the ones at the store? These beautifully designed printable Christmas tags are in colors of violet, gray, and gold. 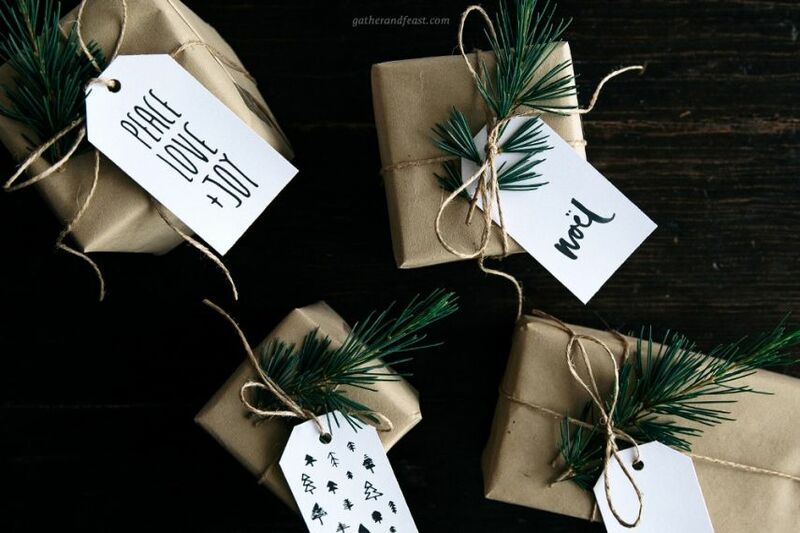 I love this unique color scheme and you can bet that I'll be using some of these printable Christmas gift tags on my gifts this year. The Postman's Knock has created some lovely watercolor holiday tags using lovely colors of green and red to create a wreath. These print off 9 per page at about 2.5" in diameter each. You can fussy cut them like shown here or simply cut them in a circle. Use a pretty pen to add the name of the recipient in the center of the wreath. These simple and modern Christmas gift tags by Wild Olive have small images that leave you plenty of room to write on them. Mittens, birds, wreaths, and snow globes are a just a few of the images that adorn these printable Christmas gift tags. These free, printable Christmas gift tags are so adorable! You'll get to print out a snowman, reindeer, holly, and a cup of hot cocoa. Another lovely set of free, printable Christmas gift tags can be found over at The Black Apple. These gift tags feature a bird, mitten, Christmas tree, house, cocoa, and little girl. They've done it again, this time with a collection of wintry holiday tags. Print these lovely Christmas gift tags that feature snowmen, trees, candy canes, and more. These free, printable Christmas gift tags can be printed in red or in blue. I love how when you print them you get so many different styles and shapes. What a great collection. Here's another set of printable Christmas gift tags by Living Locurto. These incredibly cute holiday gift tags can also be printed out on sticker paper and used as labels. These are some adorable and unique printable Christmas gift tags that wish the recipient "Peace, Love, and Reindeer Hugs." Download these printable Christmas gift tags as a PDF and print away. You'll have instant mittens and stockings to top your gifts with this set of printable Christmas gift tags by Martha Stewart. Make the gift tags even more special by adding buttons, ribbon, or stitching after you print them out. I really adore these style Christmas gift tags designed by Caroline Johansson. There are nine different printable Christmas tags here that include images of gifts, ribbon, hats, gloves, and hearts. Christmas tag designs include a reindeer, Santa belt, and Christmas wishes. These red and teal holiday gift tags by Paper Crave will really make your gift stand out. You can also print these in fuchsia and lime, and light and dark blue. Holiday Gift Tags by Orange You Lucky! There are two pages here of unique printable Christmas gift tags here that would be so fun to use this year. These are so colorful and I think kids especially would love these fun designs. You'll find twelve different designs of printable Christmas gift tags here in gray, red, and white. Punch a hole and add a string for an instant add of sophistication to these printable Christmas gift tags. These printable Christmas gift tags come in Christmas red and icy blue as shown here but also come in the color scheme of black/taupe/green. Each download will get you a page full of festive Christmas gift tags that are all ready to be printed. I think everyone on your gift list this Christmas will enjoy these gift tags but especially the kids. Each printable Christmas gift tag has a picture of a very cute elf and a place to write your to and from. Mommy by Day Crafter by Night has some printable Christmas gift tags to wish everyone on your list "Happy Holidays", "HoHoHo", "Have a Holly Jolly Christmas", and "Merry Christmas". All designs come in both green and red and can be printed out each design per page. I adore just about anything with owls on it and these printable Christmas gift tags from My Owl Barn is no exception. Designed in cherry pink and green, you won't be able to resist printing off these tags. Print out 8 tags per page, each one different from the next. A Fanciful Twist has designed some wonderfully whimsy printable Christmas gift tags for you. Print off a page of these free Christmas gift tags and you'll get seven different designs. I simply adore this snowman printable Christmas gift tag and I think you will too. You can download this design and print it as 8 gift tags on the paper of your choice. These free, printable Christmas gift tags are so fun! They feature Santa, Rudolph, and a silhouette. You can find even more tags that feature more holiday pals. You could also use these Christmas tags as garland, ornaments, or place cards. Hey Susy has designed some lovely holiday gift cards that just need to be printed, folded, and signed. So easy! There are two designs that can be printed here - bows and joy. I simply adore these printable Christmas gift tags that feature a reindeer and Christmas lights. They look very easy to put together and really just makes that gift extra special. If you're looking for some unique printable Christmas gift tags than look no further than these feather-shaped ones from Basic Invite. Use one or all of these on your Christmas gifts this year. You can print 6 printable Christmas gift tags on a page when you print these designs from Hello!Lucky. The designs include gifts, snowflakes, and confetti. These printable Christmas gift tags are a great traditional tag that prints 4 to a page. In addition to these free gift tags, there are also printable note cards, labels, and envelopes that match. Each of the three printable Christmas gift tags here ​were clearly designed with love by Eat Drink Chic. Included are gift tags to convey "Love", "Noel", and "Happy Holidays." If you like to serve your holiday gifts with a side of sarcasm, you'll love these free, printable tags from A Girl & a Glue Gun. These holiday tags are red, black, and white checked plaid and have 10 witty sayings that you're friends and family will love. After you've printed them out, write in who the gift is to and from. If you have a Silhouette cutting machine, you're going to love this free cut file created by Mel Stampz. There are 8 different designs that include a tree, ornament, gift, snowflakes, stars, and more.